Sweet zones are areas on the stringbed where the power potential exceeds a designated amount. Sweet zones are always longer than they are wide, because off-center hits twist the racquet, losing power in the process. Sweet zones are also comfort zones. The larger and "sweeter" the area of the zone, the less the racquet is twisting, rotating and recoiling. Most players make contact between 21 and 23 inches up the racquet. That location is usually in or close to the 30% zone. Each zone is 10 percentage points wide, being higher toward its middle and lower towards its periphery. The areas measured are all above the 19-inch line. The curve fit lines below 19 inches are extrapolations. Sweet zones are areas on the stringbed that have a measured power potential that is greater than a certain percent — 20, 30, 40 and 50 percent. Each area is bounded by an colored line and includes any colored areas within it. For example, all areas inside the 20% red line have a power potential greater than 20% and all within the blue, 30%, etc. 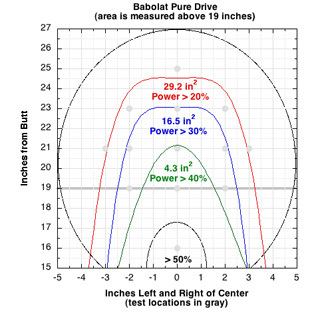 For a stationary racquet, power potential is defined as the ratio of the ball's rebound speed to its incident speed, multiplied by 100 to define a percentage. 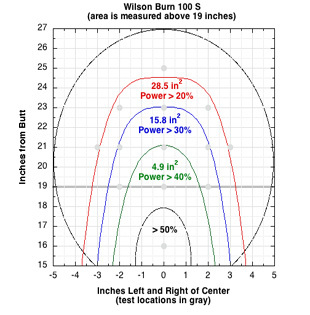 If the rebound speed (also known as the bounce speed) is 20 mph and the incident speed is 60 mph, then the power potential is (20 / 60) x 100 = 30%. The bounce speed will depend on where on the stringbed the ball hits. The maximum power potential location is at the balance point, so all zone areas emanate from there.